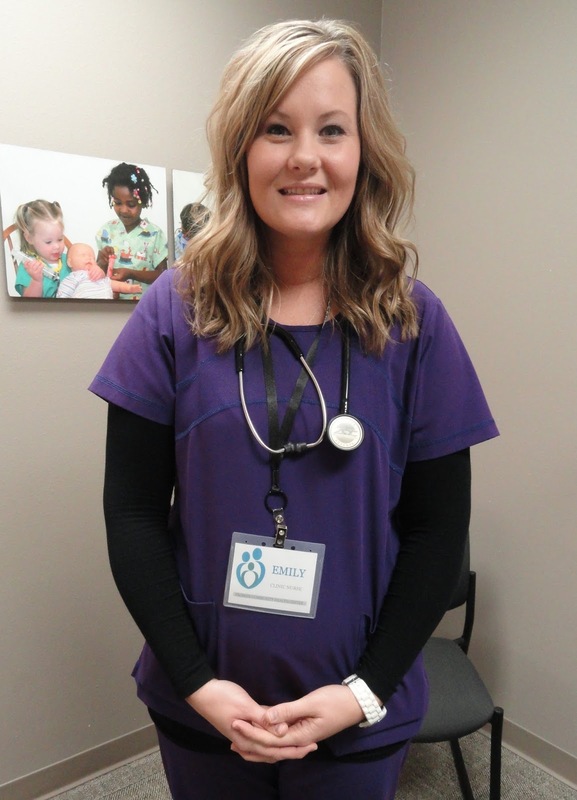 SIOUX CENTER – Emily Tuschen is experiencing a transition in her nursing career. For the past eight years, she worked as a nurse in a hospital setting. at Promise Community Health Center in Sioux Center. Now, she is excited about serving in a clinic setting as a new nurse at Promise Community Health Center in Sioux Center. Emily grew up in Platte, SD, and graduated from Dakota Christian High School in New Holland, SD, in 2004. She earned an associate's degree in nursing at St. Luke’s College in Sioux City in 2008 and her bachelor’s of science degree in nursing at Dordt College in Sioux Center in 2009. Emily worked at Sioux Center Health, 2007-16, and Orange City Area Health System, 2009-10. She liked the variety of the experiences in different departments every time that she worked – emergency, labor and delivery, postpartum and medical floor – but she’s looking forward to building a new knowledge base and becoming more involved with the continuity of patient care at Promise. Emily Tuschen and her husband, Aaron, live in Sioux Center. They have three children, Kenley, 5; Brody, 4; and Evia, 3 months. In her free time, Emily enjoys playing with her kids, spending time with friends and drinking coffee. SIOUX CENTER – Dawna Faber did not mind having her teeth checked and cleaned as a kid. She never had a fear of going to the dentist. years in Rapid City, SD, and and Denver, CO.
Now, she hopes she can bring “a friendly face and comfort” to patients who come to their dental appointments at Promise Community Health Center in Sioux Center so they can have that same positive experience. Dawna has taken on the role of a dental assistant at the health center after serving in similar positions for the past seven years. “The most rewarding thing is having my patients feel comfortable when they come in – also being able to get to know my patients personally,” she said. Dawna grew up in Inwood and graduated from West Lyon High School in 2007. 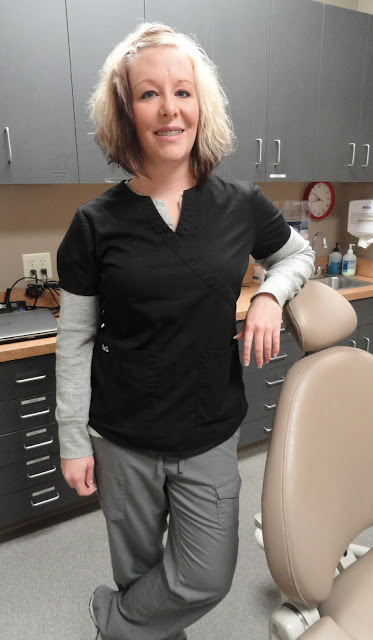 She went on to Lake Area Technical Institute in Watertown, SD, where she received her certified dental assistant with expanded functions diploma in 2008. She then filled various positions, including working with general dentistry, implant specializing, endodontics, cosmetic dentistry and even sleep apnea, in offices in Rapid City, SD, and Denver, CO. She moved back to northwest Iowa in December. As a dental assistant at Promise, she will interact with patients; get them ready for their appointments with the dentist, Dr. Kenneth Tjeerdsma, and dental hygienist Becka Hooyer; and assist with any procedures. She also will help educate patients on overall dental health, ranging from procedures being done to proper hygiene techniques. Dawna was interested in serving at Promise as a dental assistant because it gives her the opportunity help people in the area where she grew up. She also is impressed by Promise. “They are doing a great job of being able to treat each and all of a person’s individual needs, from medical, to dental, to vision, etc., all in one place,” she said. Dawna Faber lives in Inwood. In her free time, she enjoys snowmobiling, spending time with friends and family, and trying new activities. 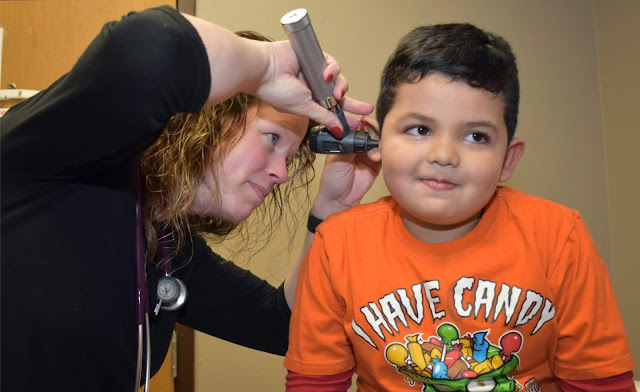 SIOUX CENTER – Karen Sanchez has had an interest in the medical field for as long as she can remember and always has had a special connection with children. When she was in middle school, that interest only increased when her younger sister was diagnosed with asthma. That gave her the opportunity to tour Avera’s medical facilities in Sioux Falls, opening her eyes to various pediatric specialties. She knew she wanted to pursue a career in caring for children. launch of vision services during mid-February. Karen now has that opportunity. She has assumed the role of optometry/medical assistant at Promise Community Health Center in Sioux Center. Karen grew up in Hull and graduated from Rock Valley High School in 2014. She then attended a year at Northwest Iowa Community College in Sheldon before starting to work at Staples Promotional Products in Orange City in May 2015. She’s now excited to work at Promise, where she will participate in the establishment of the new vision program, which will launch in mid-February at the health center. Her job duties will include assisting providers in both vision and medical services. She will prepare the rooms for the patients’ visits, will communicate with patients about their health needs and prepare them for the visit with the provider and any exams or tests, and will offer basic education to the patients. She also will interpret for Spanish-speaking patients. She has found Promise to be “a well-rounded organization” that has “the most incredible and kind” board and staff. She said Promise’s personnel truly care about the well-being and health of their patients. She wants to play her part in that. Karen Sanchez lives in Orange City. She enjoys spending time with family and friends, playing sports and being active, watching Netflix and attending her siblings’ sports events. Promise Community Health Center is targeting mid-February for the start of its new vision program in its downtown Sioux Center health center. The tentative vision care hours are 8 a.m.-noon Wednesdays initially. Dr. Dan Clousing, an optometrist for Beaver Eye Care in Sioux Center, will serve as the on-site vision provider. SIOUX CENTER – Carrie Vander Schaaf has a knack for working with numbers. 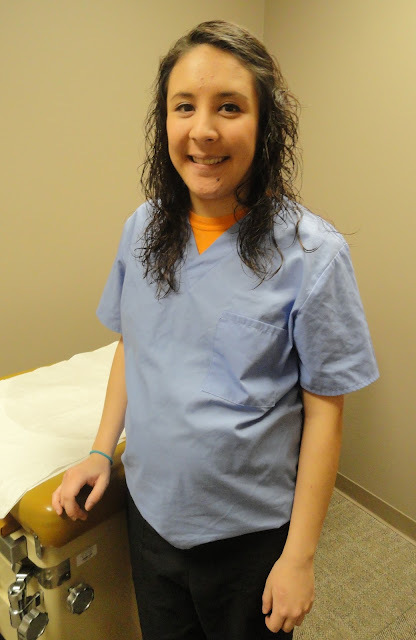 She will put that skill to good use at Promise Community Health Center in Sioux Center. Vander Schaaf recently assumed the position of finance assistant, a new role that has been created at Promise. patients as efficiently as possible. “I enjoy serving others, and Promise is a place where I can do that every day,” she said. Vander Schaaf grew up on a farm southwest of Maurice and graduated from MOC-Floyd Valley High School in Orange City in 2007. She earned a bachelor’s degree at Northwestern College in Orange City in December 2010 – with a major in accounting and a minor in Spanish. After college, she worked for Cain Ellsworth & Co. in Sheldon, January 2011-October 2013; Sioux County Auditor’s Office in Orange City, November 2013-December 2014; and Van Bruggen & Vande Vegte in Orange City, January 2015-December 2015. “For accounting, I like making sure the numbers are working together properly, and I like the challenge of fixing numbers that are out of balance,” she said. Vander Schaaf was interested in the variety of duties of Promise’s finance assistant position, including working with accounts payable, maintaining the fixed-assets schedule, assisting in preparing monthly financial reports, and working with independent and government auditors. To be sure, she doesn’t mind not doing taxes anymore. “I am excited to help make sure the financials are well-organized so Promise can run efficiently and serve patients in the best way possible,” she said. She also hopes she can bring “a smiling face and encouragement” to those around her. Carrie Vander Schaaf and her husband, Michael, live in Orange City. They have a 11-month-old daughter, Hannah. She enjoys playing keyboard for the praise team at Maurice First Reformed Church, crocheting, reading and bicycling. 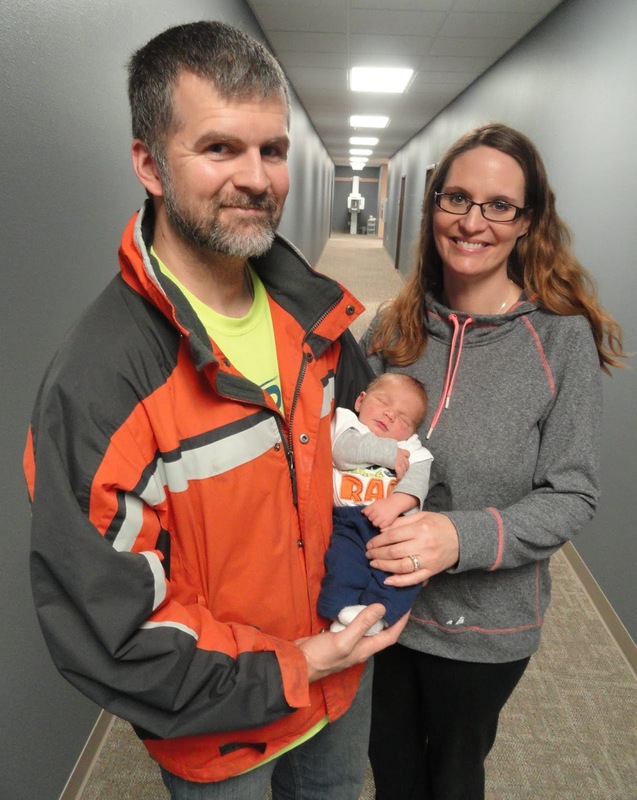 SIOUX CENTER – The birth of Mike and Melissa Anderson’s fifth baby was unlike any of the births that they had experienced before. Community Health Center of Sioux Center. Ezra Stephen was born in their Sibley home. “It was less pressure. It was very calm,” Mike agreed, noting that there were no intercoms making announcements or anything like that. Ezra also holds the distinction of being first baby of 2016 for Promise Community Health Center of Sioux Center. The healthy baby boy was born 6:45 p.m. Monday, Jan. 4, weighing 8 pounds, 4 ounces, and measuring 21 inches. He was born the day before he was due, but Mike and Melissa weren’t thinking they might have the year's first Promise Baby. Certified nurse midwife Belinda Lassen and registered nurse Kari Ney assisted with the home birth. The birthing process started about 4:30 p.m., and the baby was born about two hours and 45 minutes later. The key factor that stayed the same as the Andersons' previous four births was working with midwife Belinda throughout the pregnancy. “She understands the big picture of birthing a baby – with the mother, the family and the process,” Mike added. They forged a special bond with nurse Kari during the process, too. Melissa said they decided go with a home birth because they wanted to feel like they were more in control and had a bigger part of the decision-making. And it exceeded even her own expectations. Then the moment came when Melissa was able to hold her baby in her arms for the first time. That time with the fifth child was just as wonderful as it was with the first. “It’s really exciting,” Mike said. Ezra now has four older siblings – Gabby, 13; Alex, 10; Jude, 4; and Lucy, 1 – all wanting to hold him as often as they can. SIOUX CENTER – Years ago, the sounds of bowling pins clattering and people laughing echoed through the building. These days, people might hear the tiny cries of a newborn baby or the reassuring voice of a nurse. The sounds are different, but the building’s history only grows richer. Since opening in July 2008, Promise Community Health Center has leased the former bowling alley building at 338 First Ave. NW in downtown Sioux Center. Throughout the years, Promise has expanded its facilities by building out various sections of the building – completing its largest renovation and expansion project to date late last summer. remember it as the "old bowling alley." But Promise couldn’t call the building its own. Now, it can. The health center has officially purchased the building. Longtime Sioux Center residents and former Dordt College students have many fond memories of the building for its storied history as a bowling alley. Wilbur and Tena Huisman built the 15,168-square-foot structure as the new location for their Holiday Lanes business in 1977. They previously leased space for a bowling alley in the building that now houses the Amistad Cristiana church, but they wanted their own building where they could expand and make upgrades. but it did not own the building. Now, it does. The 16-lane venue was a bustling place for two decades – attracting everyone from families with small children to avid bowlers. But memories of the building go beyond bowling balls splashing pins. It was a gathering place – a place to eat a meal or play a game of cards. a major remodeling project last summer. The Huismans operated Holiday Lanes until the mid-1990s when health concerns caused them to retire from the business. The bowling alley stayed open for a couple more years, while they leased it out to other parties, before it ultimately closed. Members of the Huisman family purchased the building in 1999. They did some renovations, such as leveling the bowling alley floor, to make it suitable for other uses. They then rented it out to various businesses to use as storage. In 2001, Ben Camacho started leasing the front half of the building along Fourth Avenue NW for the Las Palmas Mexican Grocery Store that still operates there. Mexican restaurants also were located in that portion of the building over the years, and the rest of the structure continued to be leased out to other businesses for storage. Promise, which initially went by the name Greater Sioux Community Health Center, opened its services in the west section of the building seven years later – with its main entrance located across the street from the Sioux Center city offices. The medical areas of the health center were constructed at that time. “The building was selected because it was available and in the center of the community – accessible to the population that we were seeking to reach,” Dykstra said. Promise completed a dental wing expansion in January 2011. The latest 3,000-square-foot interior expansion, which was completed last summer in an empty section on the building's east side, increased the health center’s size by 60 percent. The expanded space includes a new prenatal wing, a community education and conference room, a behavioral health therapy room, four offices and a break room. The front reception area and other areas of the health center also were remodeled as part of that project. The building, which was purchased from the Huisman family on Dec. 30, still has a small unfinished section that could facilitate future expansion. Promise also will continue to lease the north portion of the building to Las Palmas. As they finalized the sale of the building to Promise, Van Roekel said her siblings talked about how happy their parents, who no longer are living, would be to know the building is being used as a health center. for Medicare, Medicaid and various other programs. Medicare deductible cost and $4 prescription drugs. First, seniors have their annual Medicare Part B deductible waived if they get their medical care at a Federally Qualified Health Center such as Promise CHC. Promise offers medical, dental and behavioral health care and will begin offering vision care in early 2016. The Part B deductible for 2016 is $166. At other health clinics and hospitals, seniors on Medicare are required to pay 100 percent of the deductible amount during the year before paying a 20 percent copay for medical services. When receiving care at Promise, seniors pay just 20 percent for services from the start – with Medicare paying the remaining 80 percent share. Medicare Part B helps pay for physician services, outpatient hospital care, durable medical equipment, diagnostic tests, and many other health services and supplies. Second, seniors on Medicare also might qualify for a sliding fee discount from Promise on charges for services if they are eligible under income guidelines. That will help them with their 20 percent copay cost. They also might be able to qualify for and enroll in Medicaid, the Qualified Medicare Beneficiary program and other programs based on their income with the assistance of Promise’s outreach staff. QMB covers Medicare Part A and B premiums, deductibles, coinsurance and copayment costs. Third, Promise has a selection of prescription medications available for seniors and other patients to purchase for only $4 each because of its participation in the Iowa Prescription Drug Donation Repository Program. Finally, Promise’s community care coordinators, Jessica Mora and Fatima Arteaga, will meet personally with seniors to help them understand their options. They can help patients determine if they qualify for Medicare, QMB, Promise’s sliding fee discount scale and other programs in addition to Medicare and will help them sign up for those programs. The outreach staff staff also can arrange rides for patients if needed and provide interpretation services. Promise Community Health Center, headquartered in Sioux Center, is the only Federally Qualified Health Center in the far northwest corner of Iowa. Promise provides medical, dental, prenatal and behavioral health care. To learn more, visit www.promisechc.org. Promise Community Health Center has many prescription drugs that benefit senior citizens available for $4 each because of its participation in the Iowa Prescription Drug Donation Repository Program.